The English Abroad. Top: When the exiles returned they had plenty of advice to give to would-be travellers about coaching routes across Europe and the best places to stay. 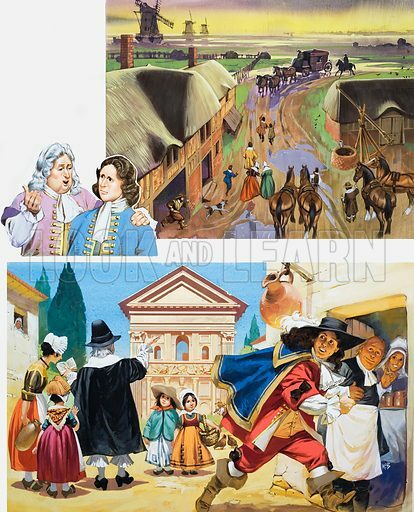 Bottom: Young men on the Grand Tour often escaped their tutors, preferring taverns to temples! Original artwork for the illustrations on p 15 of L&L issue no. 490 (5 June 1971). Available worldwide for immediate download up to 3,598 x 4,446 pixels.